$30.99 This item is selling for $30.99 on eBay. Top-Rated Sellerouronlinesalesstore consistently earns high ratings from buyers thanks to fast shipping and excellent service. CSI: Crime Scene Investigation - Season 6 Original Factory Sealed Product Details CSI: Crime Scene Investigation: The Sixth Season: Seven-disc widescreen DVD set containing all 24 episodes from the sixth season of the television series, plus DVD bonus features. Please visit our store for more seasons of CSI: Crime Scene Investigation, and for one lot of all of the seasons released to DVD! New and factory sealed. All of our items are authentic from the manufacturer and formatted to play on USA and Canada players. We never sell illegal copies or Asian imports. Synopsis: A smash hit from the moment of its 2000 debut, CSI: Crime Scene Investigation has continued to remain one of the most popular, innovative, and critically acclaimed crime dramas in television history. Created by Anthony Zuiker and executive produced by movie maven Jerry Bruckheimer, the thrilling series centers on the Las Vegas Police Department's night-shift forensics unit, which utilizes cutting-edge technology to solve the often grisly crimes of a glamorous city whose constant influx of visitors makes it rife with criminal elements. Quickwitted detective Gil Grissom (William Petersen) leads the highly skilled investigative team that includes his partner, Catherine Willows (Marg Helgenberger); hair and fiber expert Nick Stokes (George Eads); former gambling addict Warrick Brown (Gary Dourdan); and fresh-faced newbie Sara Sidle (Jorja Fox) with the help of a tough-as-nails police captain, Jim Brass (Paul Guilfoyle), and an efficient lab coroner, Dr. Al Robbins (Robert David Hall). 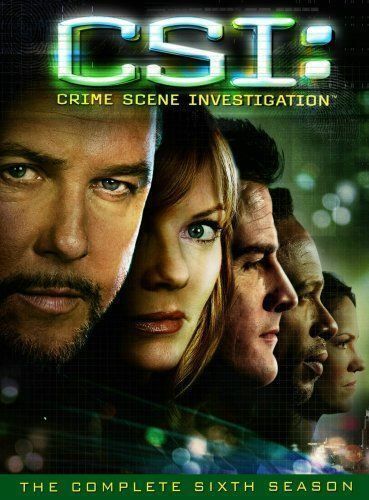 Heavy on science, creative camerawork, and uncomfortably graphic depictions of violence, CSI is praised by fans and critics alike for its consistently gripping and well-written storylines, often inspired by real-life cases. This collection presents all 24 episodes of CSI's sixth season. Specifications: Rating: Not Rated Number of Episodes: 24 Number of Discs: 7 Run Time: 1041 minutes Bonus Features: 6 Behind-the-Scenes Featurettes – The Science of Sound, Gadgets and Gizmos, Coroner Reports, Apparent Cause of Death, Season Six Trajectory, The New Title Sequence;Audio Commentaries on 6 Episodes Our items are shipped from multiple locations in the US; we tend to ship from the states that are closest to your location if those states have the ordered items. Sometimes DVD sets will arrive in multiple shipments usually right around the same time. In case one package shows up first, you'll get the next package right around the same time. PayPal only. It is your best protection as a buyer. Payment Method Shipping Handling Terms Regardless of when you purchased your disc(s) from us, if you discover that one of your discs does not play or suffers from some other manufacturing defect, please contact us; we'll solve the problem immediately. Free standard shipping to the Continental USA Only. No PO/APO Boxes. Trust also in our fast customer service, providing immediate assistance if necessary. International Shipping: We will work with's Global Shipping Program on eligible items. will charge fees and manage the shipment once they receive the package. PayPal only. It is your best protection as a buyer.